To understand the way I’m splitting things up, you first have to agree that we live in a post-Web world of networked information today. Let me try to persuade you of that, to begin with. The Web is now at most an option for digital communication of documents, literature, and art. It’s an option that fewer and fewer people are taking. Floppy disks and CD-ROMs also remain options, although they are even less frequently used. The norm today has more to do with app-based connectivity and less with the open Web. When you tweet, and when you read things on Twitter, you don’t need to use the Web; you can use your phone’s Twitter client. Facebook, Instagram, and Snapchat would be just fine if the Web was taken out behind the shed and never seen again. These are all typically used via apps, with the Web being at most an option for access. The more companies divert use of their social networks from the Web to their own proprietary apps, the more they are able to shape how their users interact — and their users are their products, that which they offer to advertisers. So, why not keep moving these users, these products, into the better-controlled conduits of app-based communication? Yes, I happen to be writing a blog entry right now — one which I don’t expect anyone to comment on, like they used to in the good old days. There is much more discussion of things I blog about on Twitter than in the comment section of my blog; this is evidence that we are in the post-Web era. People can still do Web (and even pre-Web) electronic literature and art projects. As Jodi put it in an interview this year, “You can still make websites these days.” This doesn’t change that we reached peak Web years ago. We live now in a post-Web era where some are still doing Web work, just as some are still doing pre-Web sorts of work. In my view, the pre-Web works are ones in HyperCard and the original Mac and Windows Storyspace, of course. (It may limit your audience, but you can still make work in these formats, if you like!) Some early pieces of mine, such as The Help File (written in the standard Windows help system) and my parser-based interactive fiction, written in Inform 6, are also pre-Web. You can distribute parser-based IF on the Web, and you can play it in the browser, but it was being distributed on an FTP site, the IF Archive, before the Web became the prevalent means of distribution. (The IF Archive now has a fancy new Web interface.) Before the IF Archive, interactive fiction was sold on floppy disk. I consider that the significant number of people making parser-based interactive fiction today are still doing pre-Web electronic literature work that happens to be available on the Web or sometimes in app form. Also worth noting is that Rob Wittig’s Blue Company and Scott Rettberg’s Kind of Blue are best considered pre-Web works by my reckoning, as email, the form used for them, was in wide use before the Web came along. (HTML is used in these email projects for formatting and to incorporate illustrations, so the Web does have some involvement, but the projects are still mainly email projects.) The Unknown, on the other hand, is definitely an electronic literature work of the Web. Twitterbots, as long as they last, are great examples of post-Web electronic literature, of course. 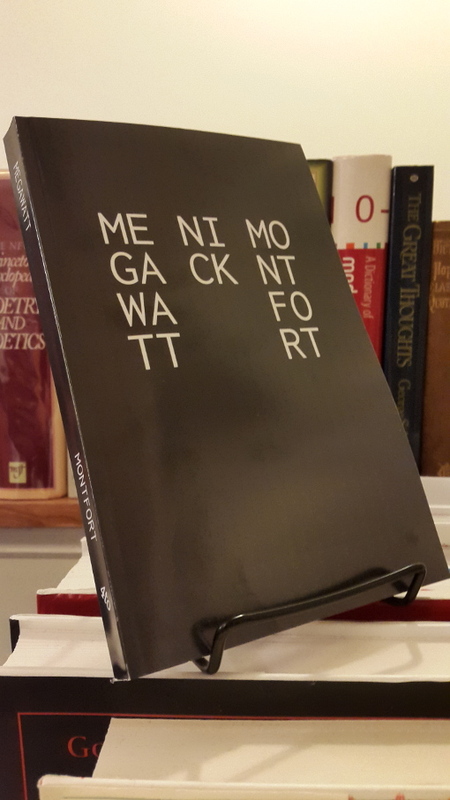 The Truelist (Nick Montfort) is more of a pre-Web project, kin to early combinatorial poetry but taken to a book-length, exhaustive extreme. Mexica (Rafael Pérez y Pérez) is more of a pre-Web project based on a “Good Old-Fashioned AI” (GOFAI) system. Articulations (Allison Parrish) is based on a large store of textual data, Project Gutenberg, shaped into verse with two different sorts of vector-space analyses, phonetic and syntactical. While Project Gutenberg predates the Web by almost two decades, it became the large-scale resource that it is today in the Web era. So, this would be a pre-Web or Web project. Encomials (Ranjit Bhatnagar), coming in September, relies on Twitter data, and indeed the firehose of it, so is a post-Web/3rd generation project. Machine Unlearning (Li Zilles), coming in September, is directly based on machine learning on data from the open Web. This is a Web-generation project which wouldn’t have come to fruition in the walled gardens of the post-Web. A Noise Such as a Man Might Make (Milton Läufer), coming in September, uses a classic algorithm from early in the 20th Century — one you could read about in Scientific American in the 1980s, and see working on USENET — to conflate two novels. It seems like a pretty clear pre-Web project to me. Ringing the Changes (Stephanie Strickland), coming in 2019, uses the combinatorics of change ringing and a reasonably small body of documents, although larger than Läufer’s two books. So, again, it would be pre-Web. Having described the “generational” tendencies of these computer-generated books, I’ll close by mentioning one of the implications of the three-part generational model, as I see it, for what we used to call “hypertext.” The pre-Web allowed for hypertexts that resided on one computer, while the Web made it much more easily possible to update a piece of hypertext writing, collaborate with others remotely, release it over time, and link out to external sites. Now, what has happened to Hypertext in the post-Web world? Just to stick to Twitter, for a moment: You can still put links into tweets, but corporate enclosure of communications means that the wild wild wild linking of the Web tends to be more constrained. Links in tweets look like often-cryptic partial URLs instead of looking like text, as they do in pre-Web and Web hypertexts. You essentially get to make a Web citation or reference, not build a hypertext, by tweeting. And hypertext links have gotten more abstruse in this third, post-Web generation! When you’re on Twitter, you’re supposed to be consuming that linear feed — automatically produced for you in the same way that birds feed their young — not clicking away of your own volition to see what the Web has to offer and exploring a network of media. The creative bots of Twitter (while they last) do subvert the standard orientation of the platform in interesting ways. But even good old fashioned hypertext is reigned in by post-Web systems. If there’s no bright post-post-Web available, I’m willing to keep making a blog post now and then, and am glad to keep making Web projects — some of which people can use as sort of free/libre/open-source 3rd-generation platforms, if they like. DBA @rottytooth; and Emily Short, alias @emshort. I kicked things off by showing some simple combinatorial text generators, including the modifiable “Stochastic Texts” from my Memory Slam reimplementation and my super-simple startup name generator, Upstart. No slides from me, just links and a bit of quick modification to show how easily one can work with literary langauge and a Web generator. That was done by creating numerous objects of class “BodyPart” (or some similar name) which just generate error messages. Not sure if it was a tremendous breakthrough. But I think there is something to the idea of gently encouraging the interactor to o play within particular boundaries. Emily’s slides (offering many other insights) may be posted in a bit – she is still traveling. I’ll link them here, if so. Update! 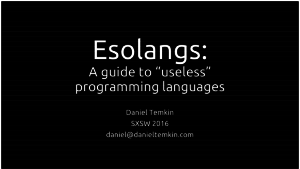 Emily’s slides are now online — please take a look. I had a trio of questions for each pair of presenters, and we had time for questions from the audience, too. The three main presenters each had really great, compact presentations that gave a critical survey of these insurgent areas, and we managed to see a bit of how they speak to each other, too. This session, and getting to talk with these three during and outside of it, certainly made SXSW Interactive worth the trip for me. There’s an audio recording of the event that’s available, too. Just as Pinocchio became a real boy, so Megawatt (my generated novel for NaNoGenMo 2014) has become a real book. The book will be for sale within a few days from the Harvard Book Store. It happened to some extent with LISP, which certainly started out as a software programming language, and the LISP machines, which supported the language with hardware features. Now, the Z-Machine, which was probably the first commercial virtual machine, developed in 1979 by Joel Berez and Marc Blank for Infocom, has been implemented in hardware using an FPGA. The Verilog code is available, so you can make your own if you like. It all goes to show you … there is no software. at the Georgia Institute of Technology and interaction designer. configurational, exploratory or writing prompts. 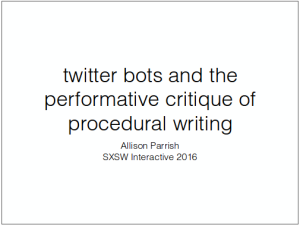 curating and making textual machines accessible? Hargrett Rare Book & Manuscript Library. Texto Digital is a peer-reviewed electronic academic journal, published twice annually in June and December by the Center for Research in Informatics, Literature and Linguistics – NuPILL (http://www.nupill.org/), linked to the Postgraduate Program in Literature, the Department of Vernacular Language and Literatures and the Center of Communication and Expression at the Federal University of Santa Catarina (UFSC), Brazil. Texto Digital publishes original articles in Portuguese, English, Spanish, French, Italian and Catalan which discuss several theoretical implications related to the texts created/inserted in electronic and digital media. Interdisciplinary by nature and range, as implied in its title with the words “text” and “digital”, the journal embraces the fields of Literature, Linguistics, Education, Arts, Computing and others, in their relation to the digital medium, yet without privileging any specific critical approach or methodology. In addition to the Articles Section, Texto Digital presents specific sections destined on publishing digital works of art, as well as interviews with recognized researchers and / or digital artists. Once submitted, all articles that meet the general scope of the journal and its guidelines will be considered for peer-review publication, even in case of issues that may favor some particular subject-matter. Texto Digital, the electronic journal published by the Center for Research in Informatics, Literature and Linguistics (NuPILL) at the Federal University of Santa Catarina (UFSC), Brazil, informs that submissions for articles are open until October 15th, 2014. Submissions for our journal are open on a continuous flow basis since September 1st, 2014, for academic papers that fit its scope. Our publication standards and guidelines are available at:. https://periodicos.ufsc.br/index.php/textodigital/about/submissions#authorGuidelines. Only papers in accordance with such criteria will be accepted. USgamer features a new interview with Zork co-author and all-around Infocom implementor Dave Lebling. Very nice! This is actually fantasy, not history. As I’ve written about in “Continuous Paper: Print interfaces and early computer writing,” as others have experienced and noted, and an amazing binder of print terminal output from an MIT student testified to me, a great deal of very early interactive fiction interaction was done on print terminals, including but not limited to the famous name-brand “Teletype.” A few people (including Lebling!) had access to top-notch video terminals, but lots of interaction was done on paper. Will Crowther even wrote the original version of Adventure in Fortran on an ASR-33 Teletype. So, when writing and first playing Adventure, perhaps the space that you would see on the paper is intentionally left blank – but you aren’t likely to be eaten by a grue. The New York Times has an article (online today, in print tomorrow) entitled “Text Games in a New Era of Stories,” about ye olde interactive fiction and new-fangled manifestations of it, including Ms. Porpentine’s Howling Dogs and Ms. Short’s Blood & Laurels. There’s a major new release of Inform 7, build 6L02, the first new release of the interactive fiction system in three years. It’s not quite Thy Dungeonman, but you can now play POET The Game, which pokes at the life of an MFA student poet in a browser-based roll-your-own-parser experience that is meant to recall the text adventures of yore. The Firewall .. is Us! Slavoj Žižek did not write a twine game, but Alan DeNiro did. It’s called We Are the Firewall, and it has more rodents than Rat Chaos. It twists and communicates with the whole category of Twine games quite well, and the writing is quite compelling, and it’s well worth reading/solving. DeNiro, by the way, is the author of (in addition to short stories and novels) the uncanny interactive fiction Deadline Enchanter, which I also recommend. Hello from Cambridge, Massachusetts, where I’m currently dressed as a grue. The streets are unnervingly lit up tonight for some reason and many people are about. Perhaps my quest to find a dark, quiet place will lead me to Fenway Park. 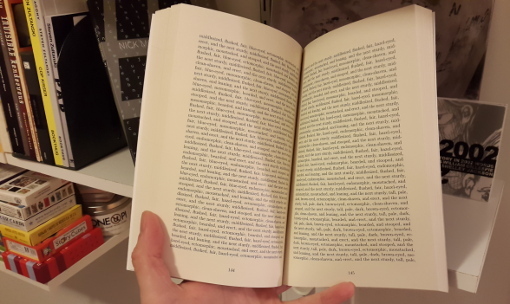 There is a lot of news about upcoming interactive fiction events, and the first part of a two-part article by Illya Szilak, “A Book Itself Is a Little Machine: Emily Short’s Interactive Fiction,” is just out in The Huffington Post. If you weren’t there, you missed Arden Kehoe presenting on her visual novel Kindness Coins at Women in Games Boston on October 29, but you can read a bit about her work at the page for the event. There will be another reading of Lost Pig (the award-winning game by Admiral Jota) on Sunday, November 3, at 6pm, at Pandemonium Books in Central Square. There will be a reading of Adam Cadre’s award-winning Photopia on Tuesday, November 5, at 5pm in University of Massachusetts Lowell’s Olsen Hall, room 311. Adam won’t be at this reading, and I don’t believe Admiral Jota will be at Pandemonium Books event. Adam did read from Photopia himself at this event in Boston way back in 2001. The “People’s Republic of Interactive Fiction” (PR-IF) meetup for November will be on Saturday, November 9, 4:00 pm, in my lab, The Trope Tank, MIT room 14N-233. (We usually meet Monday or Tuesday at 6:30pm; this is an exception.) Special guest Emily Short will be demonstrating the authoring tools behind Versu. Emily will also be speaking on Versu in New York City on Wednesday November 13. PR-IF now is on teh Twitter, as @IFinBoston, which is a good thing since there’s so much going on. Our Twitter presence is backed by the amazing technology known as Jason McIntosh. An introduction to writing interactive fiction will be offered one week after the Photopia reading, on Tuesday, November 12, same time, same place: 5pm in University of Massachusetts Lowell’s Olsen Hall, room 311. These two events at UMass Lowell are sponsored by that school’s Association for Computing Machinery (ACM). Finally, the 2013 IF Comp is currently going on. There are 35 entries. You can download, play, and vote on the games, with votes due November 15. 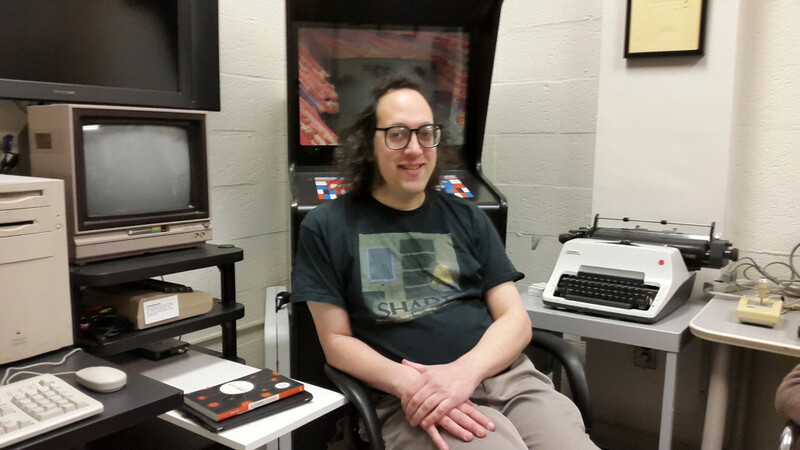 Gamebook guru Demian Katz is putting on a conference on interactive fiction, print and online, in Villanova’s Popular Culture Series. The conference does have an academic focus, but also seeks to introduce new sorts of academics to IF. Info is up now at the vupop site, where you can read about the conference or submit a proposal. Or, if there’s enough light available, examine yourself/take inventory! Aha – and the deadline for submitting something is November 1!